Mr. Suzuki, an expert in information technology of databases, delivers us reports on workflow progress in Archeological Database Department (ADD). 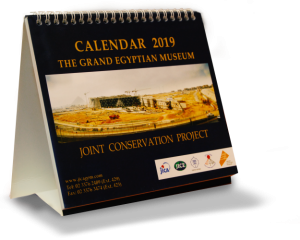 The 27th of January 2010, witnessed the beginning of transportation of selected artifacts from storerooms in different places of Cairo to be displayed in the GEM. The transportation of artifacts is mainly the responsibility of the Egyptian side, but some of the ADD staff also share in this mission. The conservators of the GEM-CC are working to pack the artifacts and put them in wooden boxes which are checked already by ADD staff to load it on trucks and transport it to the GEM-CC. Then ADD staff moves with the artifacts during the transportation process or after it is done in order not to miss the location of the artifact. They also record the data of the boxes that contain the artifacts and the rooms for keeping them in the Conservation Center in registers and inventory sheets prepared specially for this purpose. Moreover, ADD staff delivers lists and photos of the artifacts that are checked and ready for transportation to the officials from the Egyptian side in order to facilitate the work of the Egyptian archaeologist and conservators working on the sites of packing and transportation. Though there were many problems in the work site like the conflicts between the Egyptian workers and lack of working materials, by the end of April 90 artifacts from Tel Basta, 1769 from Mansura and 632 from Saqqara to GEM-CC have been transported. Work is going on to transport artifacts from Giza and the Egyptian Museum in Al-Tahrir. After that artifacts from Saqqara will be transported. The ADD staff will keep supporting the transportation process.